BLT Rice Recipe with Tiff Cayabyab. While there are variations on the BLT, the essential ingredients are bacon, lettuce, tomato, mayonnaise. The quantity and quality of the ingredients are matters of personal preference. The bacon can be well cooked or tender, but as it "carries" the other flavours. Iceberg lettuce is a common choice because it does not add too much flavour whilst adding crunch. The tomato is the key ingredient and recommends the use of the beefsteak tomato as it has more flesh and fewer seeds. The mayonnaise used significantly influences the flavour of the BLT. 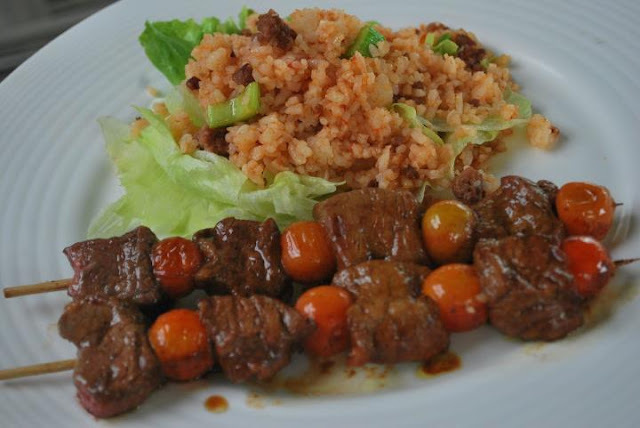 1 Season the skewered beef and tomatoes in soy sauce, oil, mustard and AJI GINISA ORIGINAL. Grill and set aside. 2 Meanwhile, make the rice by sautéing ground beef, celery, chili powder, cumin and AJI GINISA ORIGINAL. 3 Add in the crushed tomatoes and cooked rice. Toss everything together and top over the iceberg lettuce leaves and serve with the beef and tomato kabab.